I really should stop ragging on the breakfast institutions South of the Yarra, given the few that I have been to have all pleased my palate. WRONG! What a seductive trap to fall into, that of drawing conclusions from a small sample size. It would be all too easy to relinquish my inborn suspicion of how the other half live, to think that perhaps there is character and heart behind the fripperies of Chapel Street and Toorak Road et al., based on the three or so lovely little South-Side venues I have visited. Yet until I have extensively sampled the offerings over the bridge, I cannot confidently test the hypothesis that perhaps my dismissal of that area as a cultural wasteland is hasty (and bigoted). The selection bias of only going places that my companions know to be “good” isn’t helping with the validity of this study, but who wants to pay for a crummy meal at an inconvenient end of town? Well, they certainly delivered on the pear part of the equation. In fact, it seems that having a big, throbbing pear centrepiece is a bit trendy at the moment. Anyway, this was an actual feast as well as a visual feast. As I journeyed through this Garden of (about to be) Eaten, I encountered sweet, moist oats balanced by the crunch of savoury pistachio and micro-herbage. 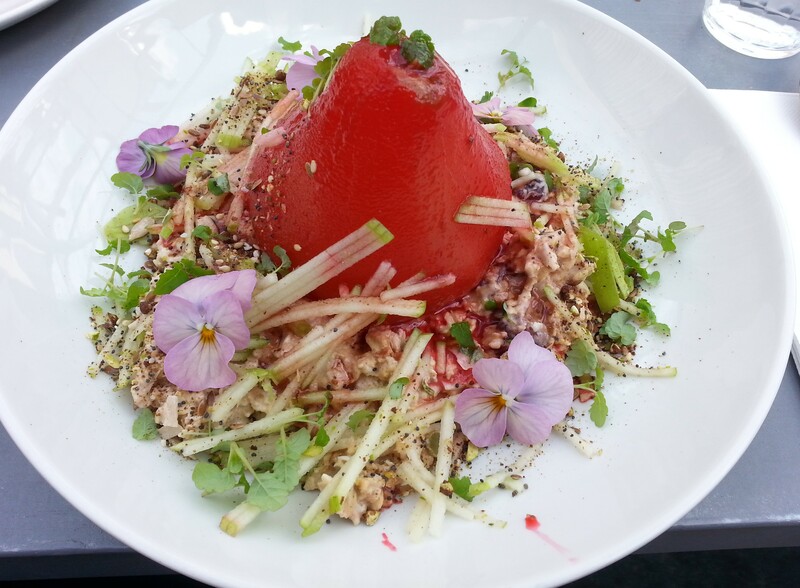 I gladly consumed the apple of this garden, not offered whole by a serpent, but Julienned by the equally dangerous South of the Yarra chef. 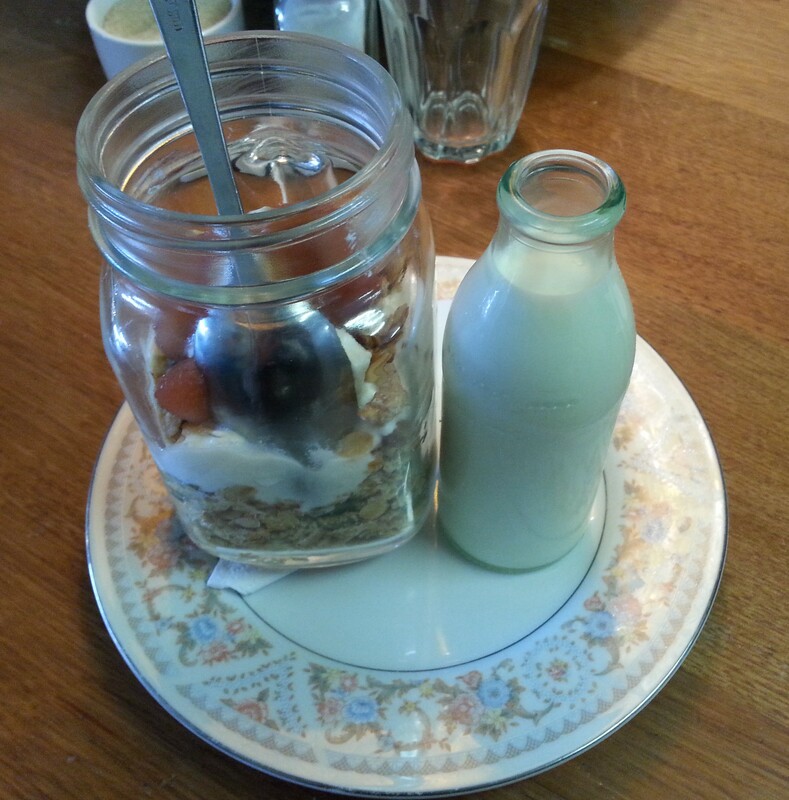 I subsequently cast aside the flowers, placed, no doubt, for my modesty (after eating one, how transgressive) and fully succumbed to this Original Sin, the sin of now considering travelling Southside of my own volition to re-experience this muesli, and of recommending that others do so. Final Word: Go! Cast aside your prejudice and taste the fruit of Tall Timber, and the muesli while you’re at it. For the last month or so I have been living the country life in Horsham, Australia’s tidiest town in 2001. Things really are pretty tidy for me here; I’m living next to my place of work and when I’m not working everything I need is a mere brisk walk away – the gym, the cinema, fried pumpkin cakes at the local fish and chip shop. The sky is tidy too, it is so refreshing to look up at night and be greeted by the Milky Way, wave hello to Orion and chuckle at the Moon. Yep, that old Moon is quite the joker; he keeps me from going stir-crazy while I’m away from Baby Chino and the rest of my life. Ahem. Anyway, to fully experience life out on the frontier, I have endeavoured to visit some cafes and bravely order the muesli. What follows is my account of the state of Wimmera cereal in 2015. Simple fare. 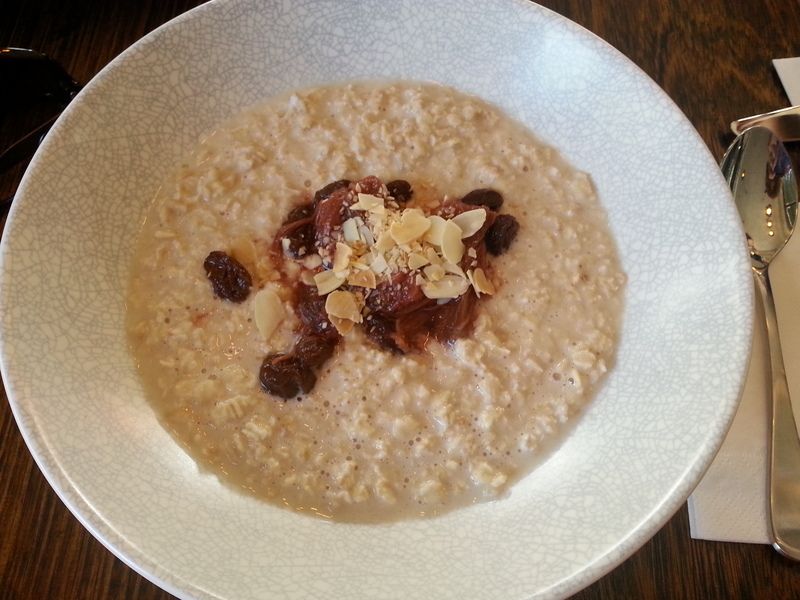 No, there were not any fruit hiding under those oats unless you count a few tiny sultana afterthoughts. There were more oats hiding under those oats, some bran for good measure and the obligatory raw nut for crunch. The beige-ness of this meal was startling, there is something to be said for a touch of brown cinnamon, a dash of pink strawberry or green kiwi fruit. 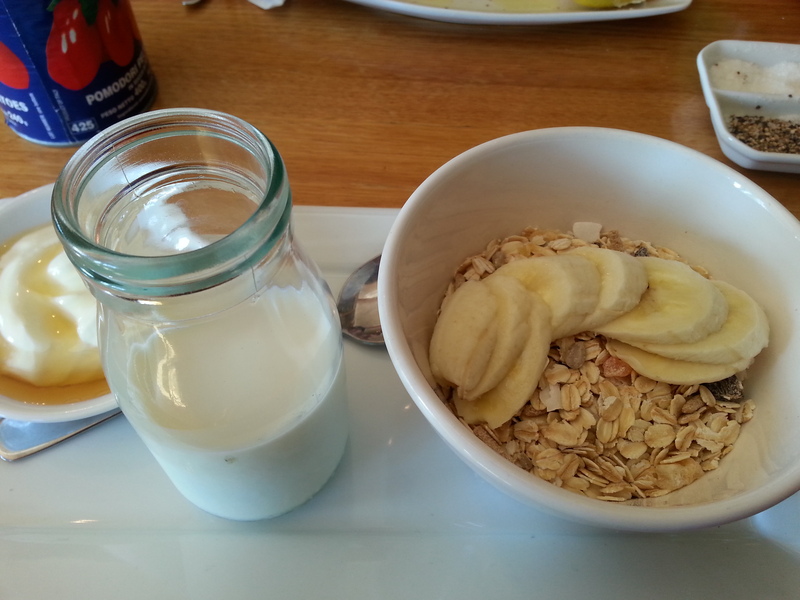 The yoghurt was a thick, creamy vanilla which suited the plain muesli well. I would recommend this muesli if you are in the days following a bout of gastroenteritis, and are starting to get sick of buttered toast. I must admit the visit to this dear little shop along the main street of Natimuk, a tiny town about 20 minutes out of Horsham, was a blur as my night-shift addled brain was screaming for sleep on an impossibly bright and cheery morning. I refrained from screaming in person and was thus able to join waking society and sit for a pleasant breakfast with my colleagues, who at that time were also creatures of the night. Natimuk Café is colourful and eclectic. The computer used to take orders is embedded in a large rock, there are postcards and drawing adorning the walls, as well as corrugated iron in parts. Shelves stacked with nick-nacks are seemingly everywhere and are illuminated by light streaming in from the large front windows. It is a homely institution and the staff are warm and friendly. 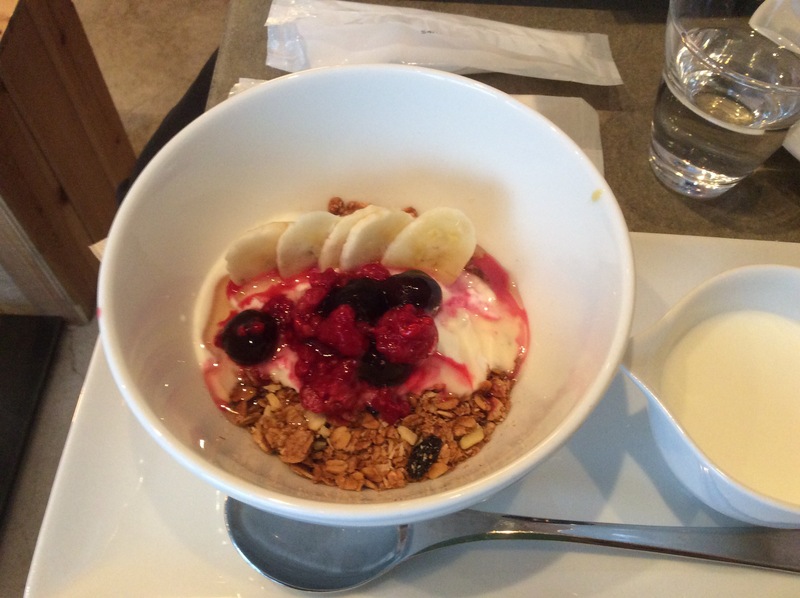 Like the muesli of Café Jas, this was quite a plain breakfast with little in the way of garnish or spice. 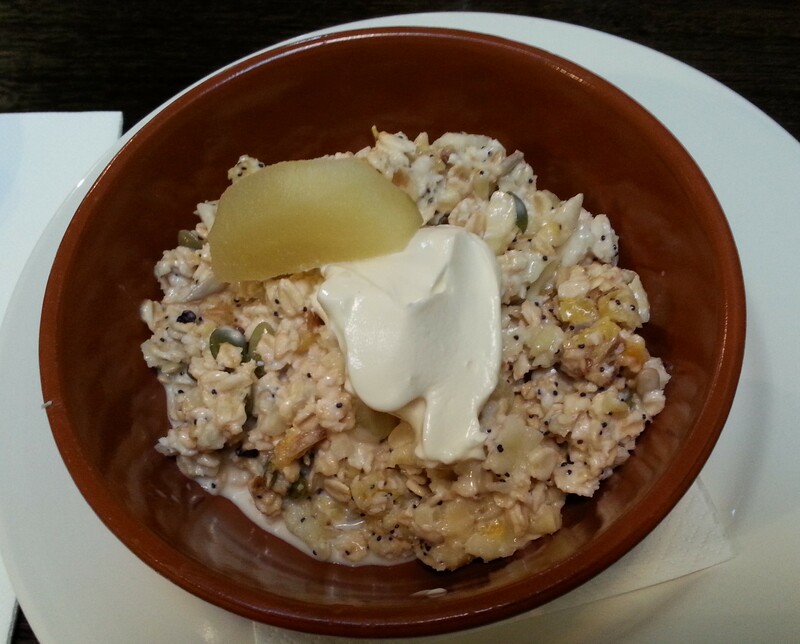 However the Natimuk muesli wins over by virtue of a sliced banana and natural yoghurt mixed with honey on the side. I suppose the bar wasn’t set particularly high, but it also had small slivers of desiccated coconut and prisms of dried fruit so that excited me. 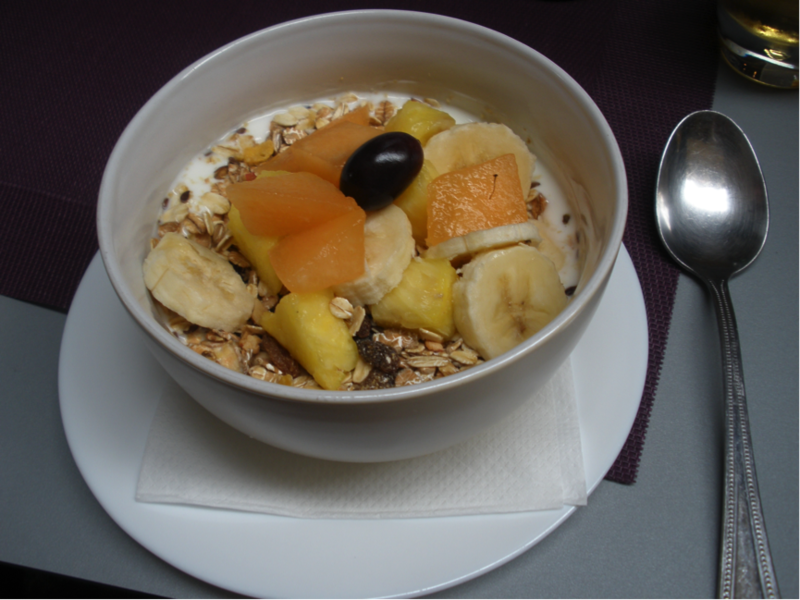 There wasn’t much to this muesli, but it tasted fresh and contained some actual fruit so it was the best I had had so far. If you do find yourself in Natimuk, bypass the muesli and grab a big slice of one of their cakes and use it as energy to go on to climb Mt Arapilies (or as a reward for doing so). You can take the strong, independent woman out of Melbourne but you cannot take the expectation for quaint, homely chic out of the said empowered adult. Basically, Chic Pea is as close to home as it gets; light timber furnishings, water in glass vessels of various shapes and sizes, pastel walls and even a wall papered with simulated raw bricks. There are various locally made jams, chutneys and preserves for sale, and the staff wear a uniform of jeans, casual shoes and country-cool. Like Melbourne, men with beards are frequently spotted lining up for coffee; unlike Melbourne this hair alights the ruddy faces of farmers, whose hands are large and calloused, and whose utes are muddy and filled with tools and whatever else people use to run farms – border collies? Serving it in a jar – why, oh why? This level of impracticality, however only endeared Chic Pea to me further as really going for it in terms of trying to create a hip café vibe, in a place where no such vibe previously existed. This breakfast was packed with juice-soaked oats, bran and puffed rice which created a solid cereal vehicle for cranberries, plump sultanas and pepitas. Finally, fruit, glorious fruit! 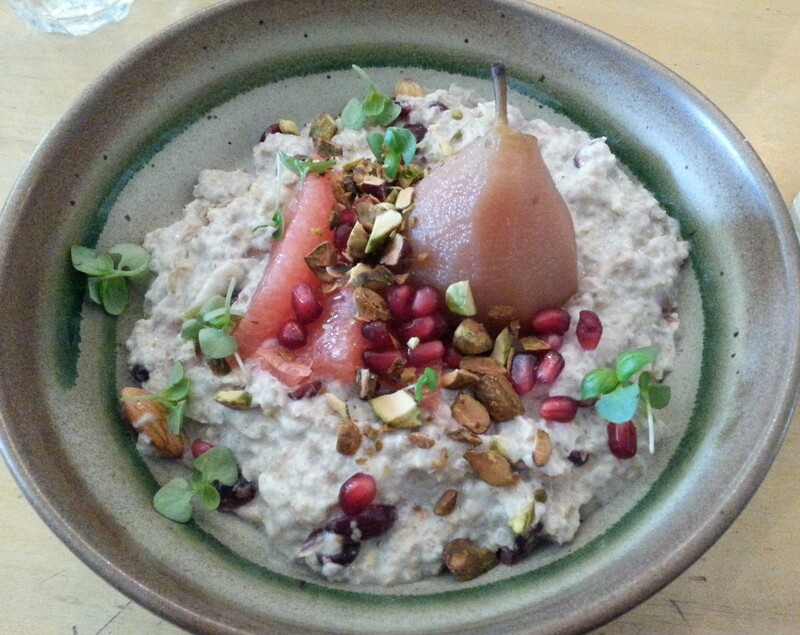 The strawberries and kiwi fruit quickly disappeared to reveal pear nestled cosily amongst the oats. Alongside this was something that Lady Grey told me was candied citrus peel. Maybe it’s a rural thing, but the peel was just too peely so after a few chews I daintily spit it aside. Apart from the inedible faux-pas, the Chic Pea Mother’s Day muesli leftovers were the best I have had in my two months away from home. I have spent an inordinate amount of time at the Comfort Inn during my stay in Horsham. I visited there two consecutive weekends, the first with Lady Grey who I suspect booked a room with two beds to enable me to stay with her so she could hear my night-time “snuffling”. That would be cute, however she also remarked I managed to form the shape of a double-decker bus under the covers. Not a single-decker, but a double one. Thanks for the self-esteem boost, mum. The very next weekend Ms Sourdough happened by and decided to also stay at this motel. No second bed this time, so it was an evening of football, knitting and then a sleepy drive back to my own temporary accommodation with the promise of a continental breakfast to entice me to return the next day. 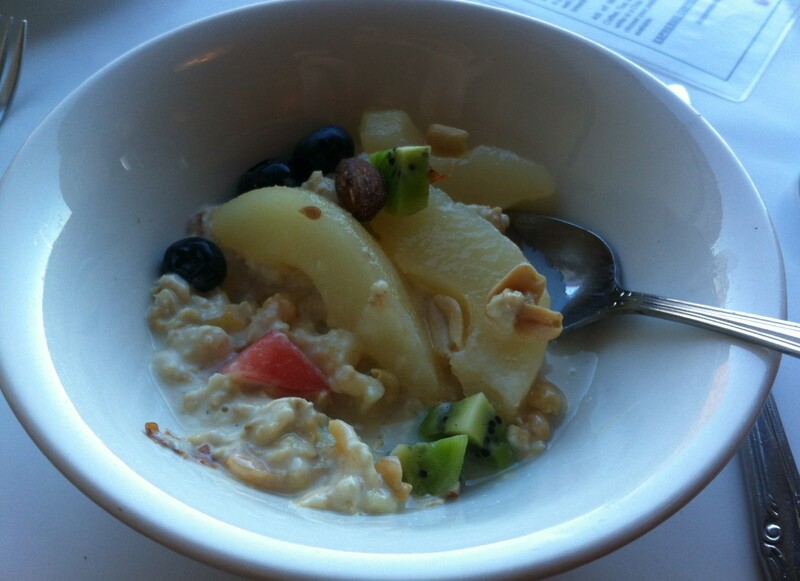 Excited to see that the Comfort Inn bother to soak their oats, I bypassed the croissants and eagerly scooped some of the wet breakfast-goop into my bowl, then topped it with pear and the fruit salad that sat nearby. So moist! It was refreshing find a wet cereal after weeks of the dry stuff. My compliments go to the Comfort Inn for taking the concept of a continental breakfast seriously and giving their oats the Swiss treatment. Juice-soaked and mixed with yoghurt, my teeth tingled with the excitement of having to do little work to transform this mush into something swallowable. Instead I got to enjoy the soft, grainy texture with the rest of my mouth. A pleasant surprise! This did not, however, prevent me from ordering pancakes and then eating a jam crumpet. It was a buffet breakfast, after all. Final word: There are many reasons to make a tree-change and live in the country, none of which should rationally include the expectation for better breakfast food. Come to Horsham and the surrounds for the long walks in the bush, the climbs up various large rock formations and the unadulterated (unless you count the atmosphere) view of the stars. If you want a warm cafe experience, my recommendations would be Chic Pea or the Natimuk Cafe – both have tasty coffee and cake; if only Chic Pea did regular muesli! Room for oaty improvement, Wimmera! Code Black forms a deceptively unassuming prism that sits opposite the Barkly Square car park on Weston Street. Like any ominous puzzle box, the starting point was obtuse and subtle, with the first test involving sliding a geometric door in a direction that would hopefully gain us entry. The black, moody interior was quite a contrast to the sunny day outside, with naked lightbulbs highlighting the cold lines of the dark tables and dividing walls. Numerous large contraptions loomed out of the dark – probably involved in the mystical process of coffee making, which seems to occur inexplicably in both giant and tiny machines depending on where you are in Melbourne. Overall, the setup at Code Black was strangely science fiction, it certainly seemed bigger on the inside. I must also make special mention that the menu promises the “Sublime and Ridiculous”, which immediately called to mind Romantic and Gothic themes of horror and epiphany; would I be reaching those heights today? Ah, no milk. Makes sense, I guess, although it would have been nice to have been offered a soy/nut alternative. 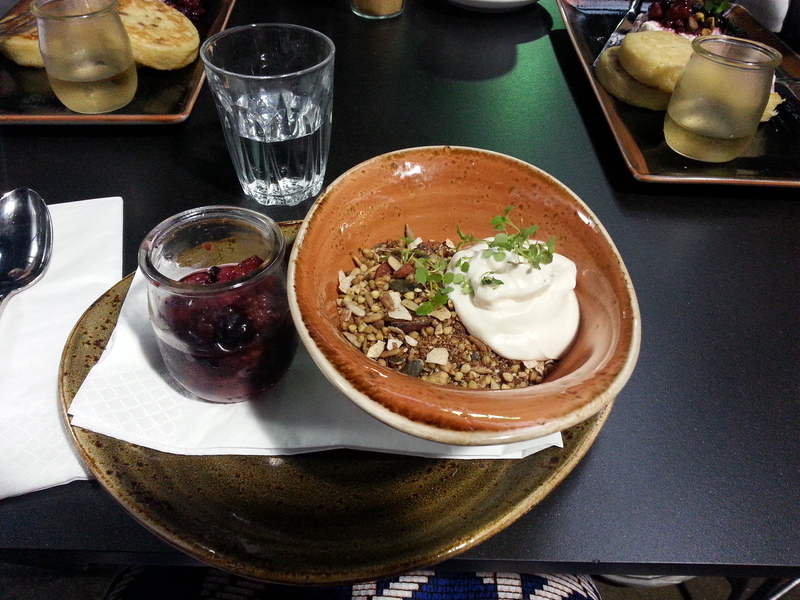 I was too coyed by the specificity of the muesli to think about asking for anything to dampen this dish. The compote in captivity was an interesting side, I suppose mixed berries are not to everyones’ taste especially if you have not been vaccinated against Hepatitis A (thanks Nanna’s). Now, to cater for the gluten-sensitive this was a barley and seed based breakfast. It was exquisitely crunchy, and so granular in texture I was reminded of the International Soil Classification Scale; instead of silt we had cacao, barley and dried fruit instead of fine and medium gravel respectively, and boy, I could go on. For the most part the smoky, nutty taste was pleasing, but was overwhelmed by the power of the coconut yoghurt. The Code Black “muesli” was inventive, but I found it unsatisfying and non-cohesive, probably because I did’t ask for soy/nut/evil milk. Not even the gloriously useless micro herb garnish would endear me to order this one again, next time I’ll get the crumpets. Final Word: Code Black is an enigmatic institution that caters thoughtfully for many dietary creeds. The risk of this, unfortunately, is to navigate the good ship Breakfast to culinary shores so alien that one cannot help but keen for the familiar comforts of oats, grated apple, cinnamon and milk. Does that count as an epiphany? 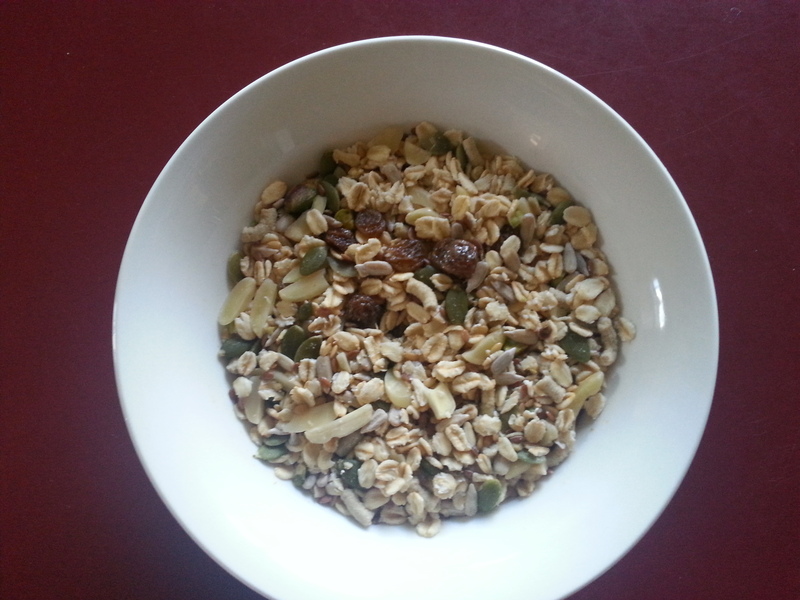 One of the best things about being a muesli-blogger is that family and friends alike suddenly come out of the woodwork as being muesli-makers. It warms my heart to receive portions of their creations, and so I have acquired a small collection of different muesli packaged in ways that causes me to fondly reflect on some of the donor’s idiosyncrasies: tiny jars (meticulous hoarder), old yoghurt containers (pragmatist) and tupperware (trusting, perhaps too much so as they might not ever see this container again). I feel quite privileged! This was a very raw, earthy muesli which was elevated to gourmet status by a smoky savouriness imparted by the pistachios. The addition of salt is surprisingly pleasing in breakfast dishes, and while I won’t be adding salt to my weetbix any time soon (or will I? Maybe that is what will make weetbix take off as a cafe food! ), salt in porridge and muesli (in the form of pistachio) is genius. Despite being soaked overnight, Lord Marmalade’s muesli was resilient to mushiness and instead was densely crunchy, adding a jaw workout to the health benefits of his dish. The only thing I might include in this breakfast next time would be a sprinkle of cinnamon (though would this blend with pistachio?) which would complement the almonds and any added banana. Final word: If I was giving out stars, this would get 5 gold ones. As I am a star-witholder (anyone who has played Super Mario 64 knows you don’t just hand them out once you find them), I’ll say for those at home: pistachios in your muesli are worth the investment. Suddenly finding myself outside of Melbourne in small side street of Dubrovnik, a town famous for being the capital of Westeros, I decided to duck into what I can only assume was ironically named Glam Café for the bad taste of muesli to remind myself of Miss Muesli who it seems loves Melbourne too much to quickly pop out. Sitting under the awning of “Glam” Café, in a thin cobbled alley with Mrs Vaguely-Witty-Name-But-Lets-Face-It-Not-Really, Mr Who-Really-Cares and Miss Self-Indulgent-Inside-Joke-With-Friend’s-Name-But-Means-Nothing-To-Everyone-Else. A quick glance at the temperature here, it’s at a boring 27° C in this shaded seaside area, while Melbourne is currently enjoying 13° C with rain at this very moment. Haha, quite the contrast. How do you them apples, Miss Muesli? …excuse me? I didn’t order müssli with fruit, I ordered müssli with freaking jogurt, what are you doing here fruit? I thought all this inside of course, smiling I thanked the waiter: hvala, hvala. So I got bloody fruit all up in this business. Too much fruit. Banana: you’re ok. Pineapple: what are you doing buddy? People only sort of tolerate you on pizza. Orange thing: lucky you have no taste. Grape/round thing/whatever you are: get out of here. All that with watered down jogurt and too small an amount of muesli. All in all, it was alright. But this is Hrvatska, not Melbourne, it’s wonderful! Dobra Hrana! Hvala Vam! 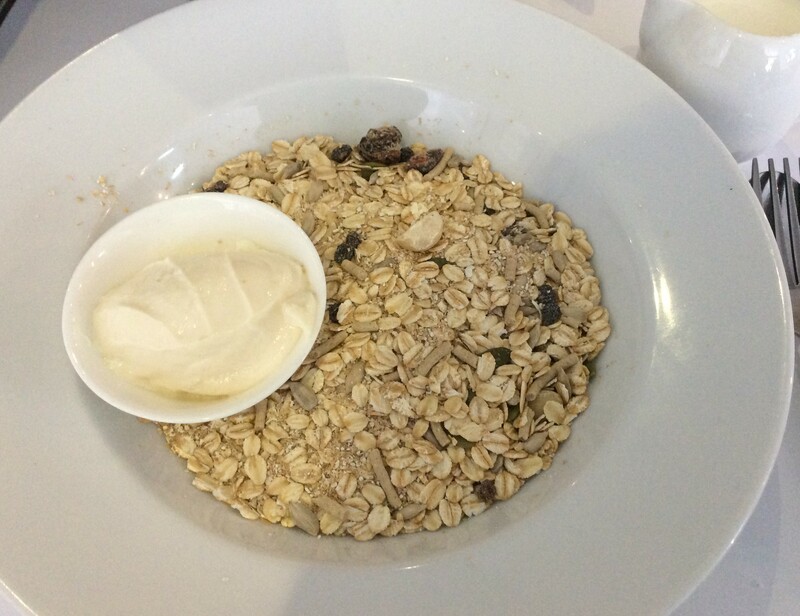 Good Muesli? Bad Muesli? 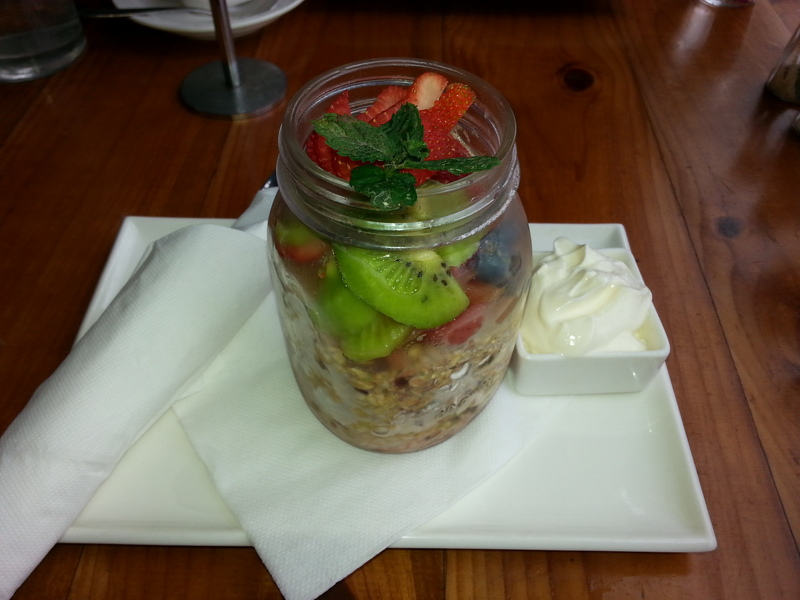 Who Cares Muesli? King’s Landing.